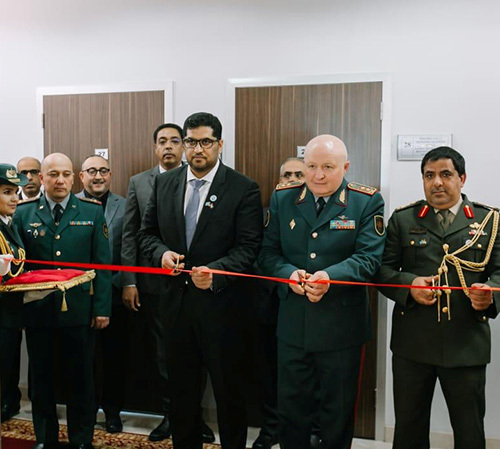 Dr. Mohammed Ahmed bin Sultan Al Jaber, UAE Ambassador to Kazakhstan, Rashid Al Mehrizi, UAE’s Military Attaché in Astana, and Murat Maikeyev, Deputy Minister of Defense of Kazakhstan, opened last week the UAE Hall at the Kazakh National Defense University, named after President Nursultan Nazarbayev. The opening ceremony was attended by Hamad Saeed Al Nuaimi, Deputy Military Attaché at the UAE Embassy in Astana, senior Kazakh defense officials and heads of the Arab missions accredited to Kazakhstan, Emirates News Agency WAM reported. Maikeyev expressed his country’s appreciation to the UAE for the opening of the hall, which, he said, would play a pivotal role in enhancing military and defense cooperation between the two countries. Ambassador Al Jaber said the hall was a testimony to the strong ties between the UAE and Kazakhstan, especially in military fields.